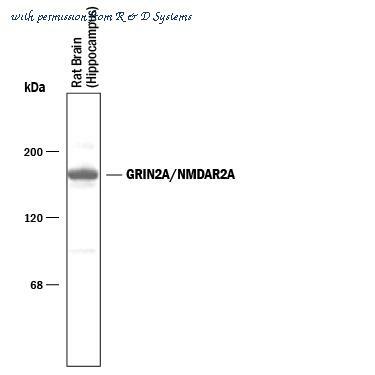 Detection of GRIN2A/NMDAR2A by Western Blot. 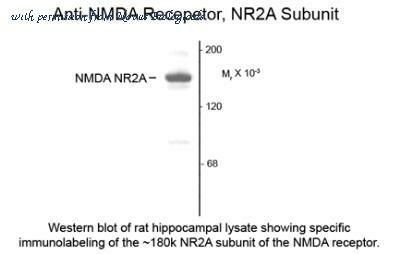 Western blot of 10 ╡g of rat brain hippocampus lysate showing specific immunolabeling of the ~180 kDa NR2A subunit of the NMDA Receptor. The labeling by the antibody was blocked by the N-terminal NR2A-subunit of the NMDA Receptor fusion protein (not shown). Western blot analysis of rat brain lysates: 1. Anti-NMDAR2A (GluN2A) (extracellular) Antibody (#AGC-002), (1:600).2. Anti-NMDAR2A (GluN2A) (extracellular) Antibody, preincubated with the control peptide antigen. 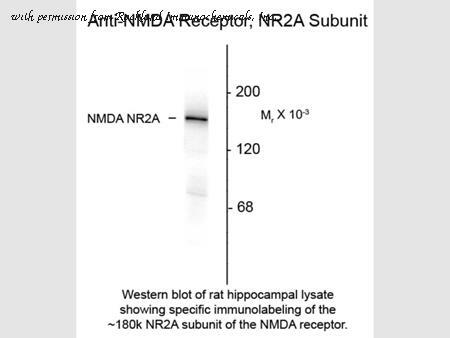 Western Blot of Rabbit anti-NMDA R2A antibody. Lane 1: rat hippocampal lysate. Lane 2: none. Load: 10 µg per lane. 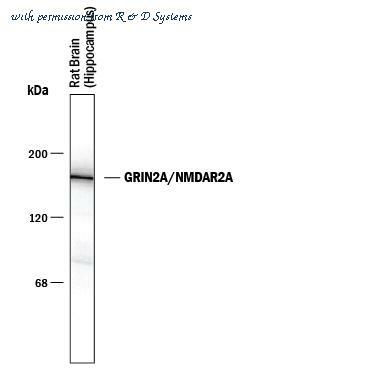 Primary antibody: NMDA R2A antibody at 1:1,000 for overnight at 4°C. Secondary antibody: IRDye800™ rabbit secondary antibody at 1:10,000 for 45 min at RT. Block: 5% BLOTTO overnight at 4°C. Predicted/Observed size: 180 kDa for NMDA R2A. Other band(s): NMDA R2A splice variants and isoforms. Western Blot of Anti-NMDA R2A (Rabbit) Antibody. Lane 1: rat hippocampal lysate. Lane 2: none. Load: 10 µg per lane. Primary antibody: NMDA R2A antibody at 1:400 for overnight at 4°C. Secondary antibody: IRDye800™ rabbit secondary antibody at 1:10,000 for 45 min at RT. Block: 5% BLOTTO overnight at 4°C. Predicted/Observed size: ~180k, 180 kDa for NR2A subunit of the NMDA receptor. Other band(s): none. 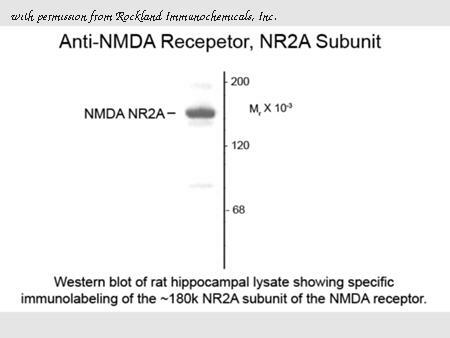 Western Blot of Rabbit anti-NMDA NR2A Subunit antibody. Lane 1: rat hippocampal (Hipp) lysate. Lane 2: none. Load: 10 µg per lane. Primary antibody: NMDA NR2A Subunit antibody at 1:1,000 for overnight at 4°C. Secondary antibody: IRDye800™ rabbit secondary antibody at 1:10,000 for 45 min at RT. Block: 5% BLOTTO overnight at 4°C. Predicted/Observed size: 120 kDa for NMDA NR2A Subunit. Other band(s): NMDA NR2A Subunit splice variants and isoforms. 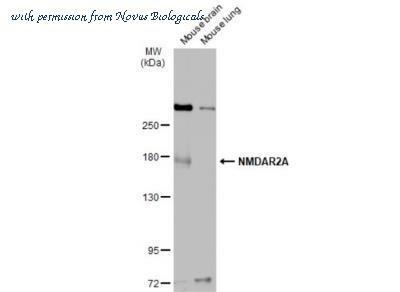 Western Blot: NMDAR2A Antibody [NBP2-19551] - Rat tissue extract (50 ug) was separated by 5% SDS-PAGE, and the membrane was blotted with NMDAR2A antibody diluted at 1:1000. The HRP-conjugated anti-rabbit IgG antibody (NBP2-19301) was used to detect the primary antibody, and the signal was developed with Trident ECL plus-Enhanced. 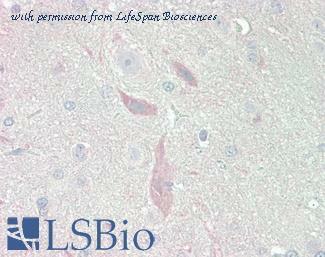 Immunohistochemical staining of rat brain tissue using GRIN2A antibody. 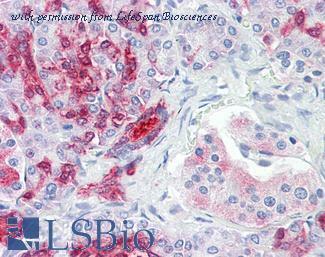 Immunohistochemical staining of rat skin tissue using GRIN2A antibody.